Working with the band from their infancy online – from literally 1 Facebook like and 1 twitter follower the brief lay with the importance of positioning the band in the right areas and picking-up early supporters that could be relied on for support throughout future campaigns. Online presence was important for the campaign in-order to pick up momentum and see that translate into both extensive coverage and growth and development across the band’s social networks and videos. It was incredibly important when we started the Darlia campaign that we started off from a very strong, well-targeted position. 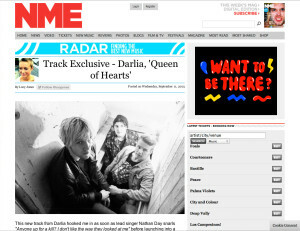 So way back in September 2013 we premiered their debut single ‘Queen of Hearts’ with NME.com following its radio premiere with Zane Lowe. This set the tone for things to follow. They deemed “‘Queen of Hearts’ is as hooky as a Bald Eagle’s beak, brimming with vim, raw energy and the suggestion of a bright future.” This premiere lead to NME’s Lucy Jones bringing the track on to the BBC Radio 1 Review show as her track selection. From this point onwards it was about picking up supporters at online tastemaker sites for their debut EP ‘Knock Knock’, these came in the shape of: a BBC Introducing interview, Indie Shuffle, Gigwise (premiered Napalm audio), Clash (premiered Napalm video) TOTD, District MTV, Crack In the Road, The 405, FRUKT fixers weekly playlist, Blah Blah Blah Science, The Tipping Point, Louder Than War ‘New Band of the Day’, XFM, This Feeling, Artrocker, It’s All Indie, and multiple Hype Machine blogs, NME’s ‘The Best Things We Heard In September’, Record of the Day’s Weekly magazine compass section featured, a Kerrang! Introducing feature (in print) and a lot of blog coverage. 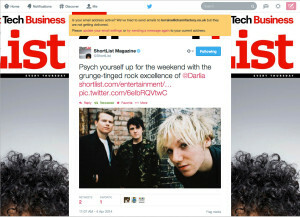 Darlia ended 2013 with tips from Gigwise ‘future indie icons’, In the Junkyard ’14 for 2014’ and XFM’s ‘100 Best Tracks of 2013’ among others. 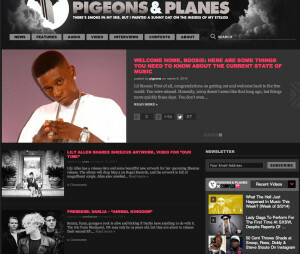 From this point onwards it was about increasing the breath of coverage, building live support, seeding out new tracks, securing well positioned premieres for tracks and videos, continuing to secure blog and tastemaker support, setting up introducing features and arranging well placed sessions and cornerstone features. Following several EP and single releases (‘Candyman’, ‘Dear Diary’, and ‘Stars Are Aligned’) Feb 2015, sees the release of Darlia’s mini album ‘Petals’ and lead single ‘Never Been To Ohio’. They spent the summer and autumn of 2014 solidifying their live reputation with sets at Glastonbury, T In The Park, Reading & Leeds, a headline tour of the UK and a support tour with Gerard Way. They’ve recently headlined The Garage k as part of the NME Awards Show series and will return for their next headline show at the Electric Ballroom, Camden on May 6th. 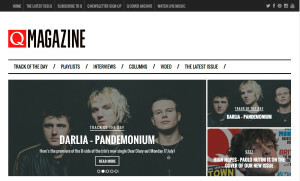 We’ve taken Darlia from ground zero to having hundreds of pieces well considered coverage, positioning them as one of the UK’s finest up and coming rock bands. 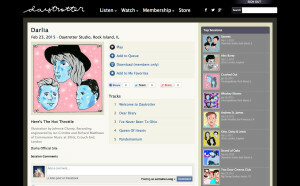 NME premieres for: ‘Queen of Hearts’, ‘Candyman’, Dear Diary and most recently the ‘Petals’ mini album stream. 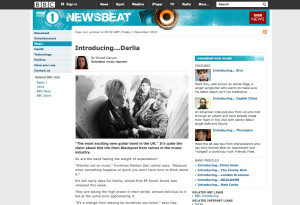 BBC Entertainment News feature on ‘The return of rock bands: Four bands to watch’ including Darlia. It was in the Top 10 Most Read on the BBC site that day and had in excess of 450K views. Guardian – New Band of the Day. 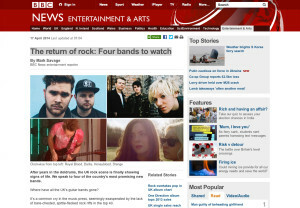 Telegraph – 5 British Guitar Bands Bringing Rock Back to Life feature. Pigeons & Planes – ‘Animal Kingdom’ audio premiere. 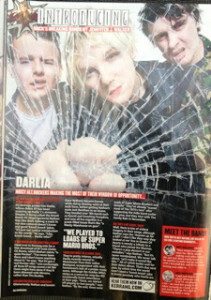 Red Bull – rising bands feature included Darlia. The Line of Best Fit – premiered ‘Blood Money’ audio and ‘Pandemonium’ (acoustic audio). NYLON – ‘Stars Are Aligned’ audio premiere. 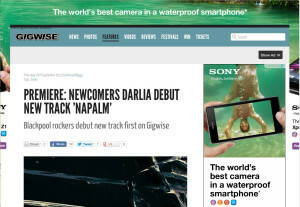 Gigwise – 11 New Rock Bands You Need To Listen to in 2014 and 31 Artists That Will Own 2015 featuring Darlia. Shortlist – ‘Shortlisten’ – Candyman. Radio 1 Newsbeat interview at TGE. 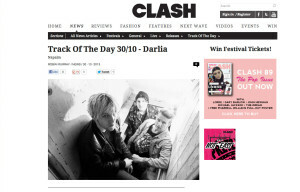 Clash – ‘Dear Diary’ video premiere and ‘Stars Are Aligned’ (Acoustic video). Our coverage has led to radio play and print coverage.